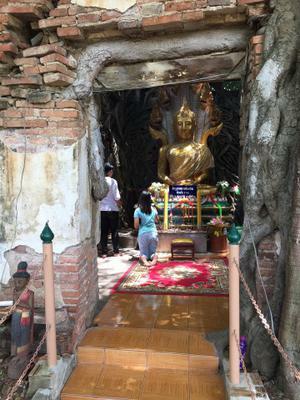 Wat Sang Kratai is located in Ang Thong City about two km west of the city centre. It’s a very old temple, more 400 years old, constructed in the Ayutthaya period. Then it was abandoned for more than 100 years, some records even state 200 years! When worshippers returned to this temple, they found only ruins. 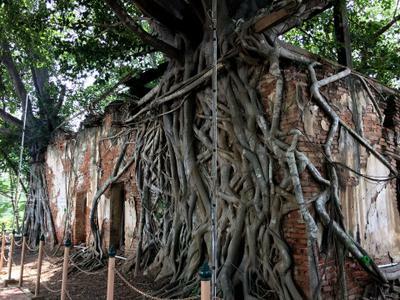 The ruins of the ubosot (ordination hall) however are buttressed by four Pho trees at the corners and along the walls holding up the crumbling building. The ubosot was roofless but shaded by the leafy boughs of the Pho trees. The ubosot is divided into three rooms and there are three huge Buddha statues inside. During our visit over the weekend, we saw many visitors praying here. 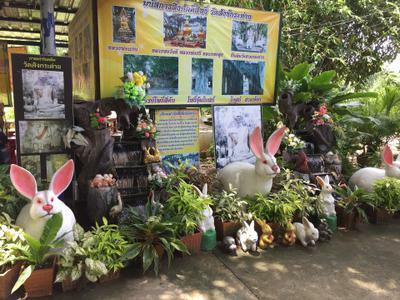 The temple used to be called Wat Sam Kratai or the three Rabbits Temple (sam – three, kratai – rabbit). 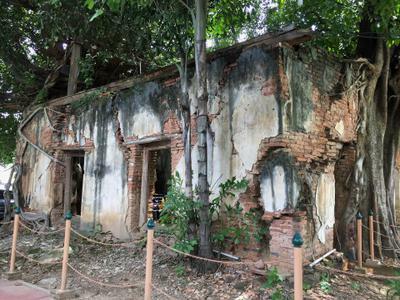 Over time the name was changed to the present, Wat Sang Kratai. These ruins have been registered as an ancient site by the department of Fine arts. Wat Sang Kratai is located in Tambon Sala Daeng, Amphur Mueang, Ang Thong. Ang Thong City is about 100 km north of Bangkok.